It’s August 8 today. Where is the summer going? It seems to be evaporating before our eyes like a puddle in the hot sun. Fear not. There’s plenty of wonderful weather left this season, or there had better be. We have lots of garden plants with great potential ahead of them before harvest time. Hopefully plenty of barbecue opportunities as well. There are some real advantages to having a small (or large) vegetable garden. The most obvious is that you get good things to eat for quite a low cost and fairly little effort. We have not been out constantly pulling weeds. Another is the sense of self-sufficiency and satisfaction it gives you. Nothing beats the feeling of running out to the garden and plucking something from the vine to bring to your table. Talk about fresh. One of our purple beans. If you plant lots of different vegetables you also get ripening overlap, so several are ready to eat at the same time. 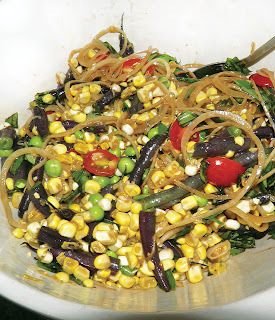 This recipe used the very last of our peas, and close to the last of our beans. If we had put out tomato sets a week earlier we could have had those, too. 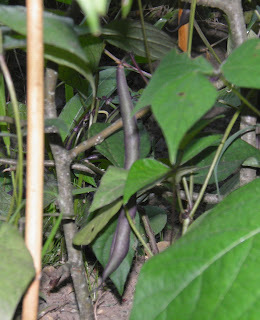 We planted two kinds of beans this year: regular green beans and purple beans. Purple beans are interesting because when raw they are a dusky purple colour. But as soon as they cook the beans turn green. That’s kind of a waste of beautiful colour. Since I was looking for visual interest and contrast I opted to use them instead of green ones. But use whatever you can get your hands on that’s good quality. That's important – good quality. If you don't have a garden you should be able to find everything at a local farmers market. When one thinks of “garden salad” the usual tomato, carrot, onion, cucumber, radish and greens springs to mind. If you’re on your third one in a week – because you have to eat what you planted – it can get sort of boring. Variety is the spice of life. So look for variety everywhere and in everything. This one’s definitely a garden salad. I can vouch that it came from our garden. But it’s deliciously different. 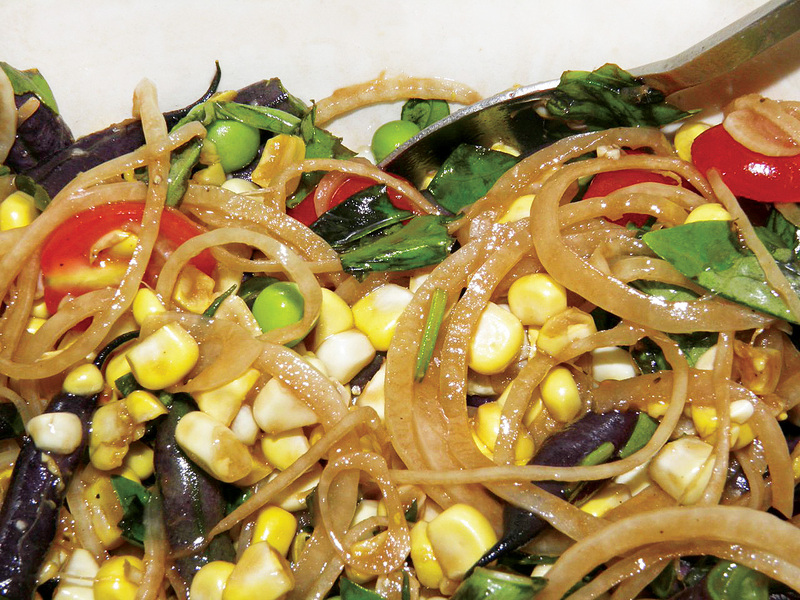 All raw, the sweet snap of the vegetables coupled with the sugary vinegar makes for something completely different. Have you ever eaten fresh, raw corn kernels? They have a sweet creaminess that is difficult to describe. They’re a perfect addition with beans and peas. And the basil? Oh...the basil! If you're not an onion fan, don't worry. The marinating time removes much of its sharpness. 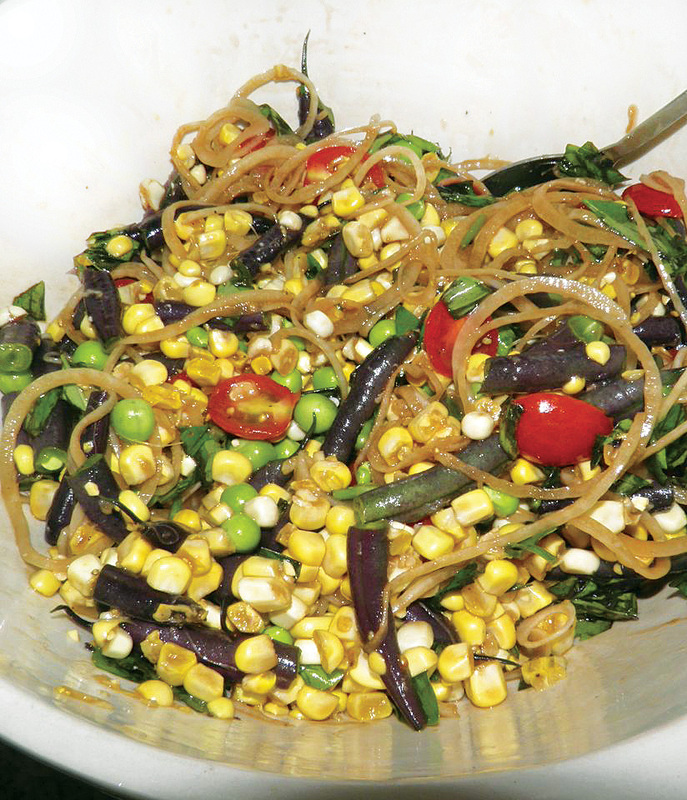 One of the main challenges with barbecuing in warm weather is to serve interesting side dishes. Traditional garden salad is a stand-by, as is potato salad, but it’s always fun to serve something a little different. If you can get your hands on fresh corn, peas, beans and tomato I strongly suggest that you try this one out. It takes no time at all to make, and keeps out out of a hot kitchen. The weekend is coming and it sounds like Saturday will be barbecue weather! Remove the husk from the corn. Cut the kernels by slicing down the side against the cob. Place in a bowl. Shell the peas and add to the corn. Stem the beans and snap into thirds. Halve the tomatoes and add. Using a mandolin, thinly slice the onion. Tear or roughly chop the basil. Toss all together very well. Mix the vinegar, oil, sugar, salt and pepper in a small jar. Shake vigorously, pour over the top of the vegetables and toss well. Cover with plastic wrap and let sit at room temperature for about 1/2 hour. Toss again just before serving.